The Medina of Marrakesh is UNESCO World Heritage since 1985 and is one of the most attractive destinations in the world and one of the most visited places in Morocco. From Riad La Belle Epoque we suggest 25 essential things to do during your visit to Marrakech. 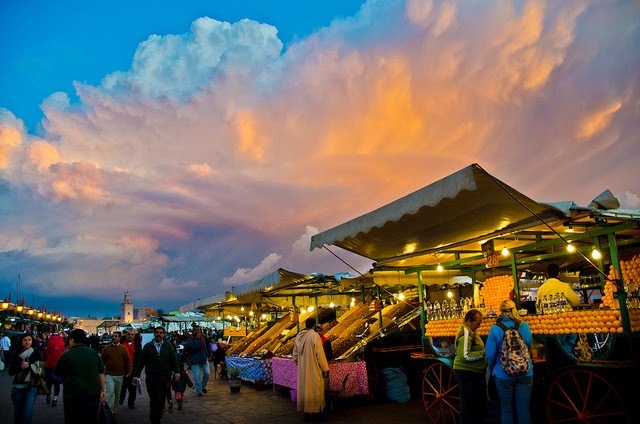 Undoubtedly the emblem of this city, "The Place" (square), as everyone knows it, is the best known place of Marrakesh. Being in the heart of the Medina, is busy daily and visited by thousands of people and is the meeting and leisure point of the inhabitants of the city and visitors from the rest of the World. His visit is a must and not only because the square itself is architecturally interesting, a big space with no high buildings surrounding it, but for the people and customs that populate it. Surrounded by cafes and restaurants with superb terraces, is the perfect spot for the contemplation of life flowing through the square. Located next to the bazaar where you can find almost anything that can be bought, the Square have their own schedules and if in the morning it is populated by freshly squeezed orange juice stalls , in the afternoon they become in stalls of olives, nuts and dates, and with the arrival of tourists and locals passing by it begins to fill with a mix of interesting characters: Storytellers, water carriers, snake charmers, dancers, fortune tellers, letter writers,, dentists, all of them sharing the same space . By the end of the afternoon dozens of restaurants-bars identified by numbers, open their doors to visitors for delight of locals and foreigners,. You can eat everything, from fish brought from the nearby Atlantic coast or salads with the best products of the orchards that surround Marrakesh, to the typical dishes of Moroccan cuisine: Tagines, couscous, lamb head or delicious snails. Please indulge yourself with a delicious orange juice in the morning and get lost between the characters that populate this singular place. The most searched products in the souks are bags and leather articles, rugs, spices and nuts and argan oil, widely used as a cosmetic but can also be used as a culinary spice. Fabrics, leather and metal objects are the typical handicrafts presents in everywhere. Spectacular and worth the visit, are the Place des Epices or The Street of Carpets, not to mention blacksmiths market. The souks are in an adaptation process and although years ago his visit was fascinating, it was very comun the harassment. Today everything has become much more relaxed, with no pressure and many shops have even displayed their prices on the goods they are selling. Obviously the haggling continues and is an experience you can not miss. If you take it slow and with respect, you will find it as a fun and rewarding activity. Our advice is not to show too much interest in a product and keep in mind that although Morocco is a cheap country a handmade product has its work behind and there´s always a minimum price below which the artisan will never sell it. Anyway the first price they will launch will be between two and three times what we should pay. A shop where you can find everything with excellent quality is Mustapha Blaoui 142-144 Bab Doukkala, Marrakech ( 00 212 524 385 240). This shop is hidden behind huge double doors lacking number or other indication, near Riad la Belle Epoque. As we crossed the threshold, it is as if we enter into Aladdin's cave. Hundreds of beautiful carpets lining the walls and dozens of huge lamps hanging from the ceiling, certainly not for a standard house, but worth to visit. Furniture of all kinds and a varied crafts are presented to us in a labyrinthine network of corridors and rooms of different sizes. The friendly staff will help you to find what you want and if you finally find something and you can afford to pay it, they can even send it back home, with and extra cost, of course. To buy souvenirs to friends and family back home, for those of you without bargaining skills and without time, we recommend the Artisan Center (Kasbah 7 Derb Baissi Kasbah (+212 5 24 38 18 53). Open daily from 8.30 am-7pm). It's the closest thing to a mall in Marrakesh and here you will find slippers, tallines, ceramic tea sets, leather bags, rugs, jewelry and T-shirts made ​​in China .... almost everything. A little more expensive than in the souk but for sure you will save time. If once at home you have forgotten something or this item that you love do not fit into your bag, do not worry, in the online shop Artesanía Marroquí you can always buy your favorite Morrocan handicraft. They have a wide range of products brought from Morocco and it is easy to find what you want. At Riad La Belle Epoque we always recommend a guided tour of the souks at the beginning of your stay. It is a rewarding experience that will provide a totally different picture of the Medina, and it will also serve to learn how to navigation around the maze of streets and alleys, basic to your later walks around the city. The visit with accredited guide costs 100 €/group all day or 50€/group for half day. Let us know if you are interested and we'll inform you about this tours. The minaret of the Koutoubia, is the symbol of Marrakesh and it is visible from many parts of the city. This is not because of its hight (only 70 meters) but by the city ordinance that prohibits to build any building higher than a palm tree. Its figure reminds us of the Giralda in Seville, built on the same architectural style inspired by the Koutoubia, and the surroundings are very pleasant and indifferent to the bustle of the nearby square. The visit to non-Muslims is not allowed, but it's worth to walk around it and rest while the muezzin intones his prayers from the top of the minaret. Northeast of the square you can see the Mosque and the Ben Youssef Madrasa. A madrassa is a Koranic school where students memorizes the Quran. Built in the fourteenth century, Ben Youssef´s Madrasa was the most important religious school in Morocco, accommodating up to 900 students. It was destroyed and later rebuilt by the Saadian, who provided a larger sample of art and architecture. This Madrasa is a beautiful building decorated with mosaics, delicate carved paneled walls and ceilings. 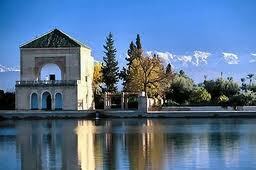 and hosts some of the finest examples of Moroccan´s architecture and art. Its visit is really fast and in it you will see a large courtyard with a central pool for ablutions, a prayer room in which you will see the most exuberant decorations, and some cells. Visiting hours: Open daily from 9:00 to 18:00. The Saadian tombs in Marrakesh date from the time of Sultan Ahmad al-Mansur (1578-1603). The tombs were discovered in 1917 and were restored by the Fine Arts Services. Flanking the south side of the Kasbah´s Mosque, the place is probably the most visited monument in Marrakesh. This is an old walled garden with a mausoleum where are buried six members of the Saadi Dynasty. 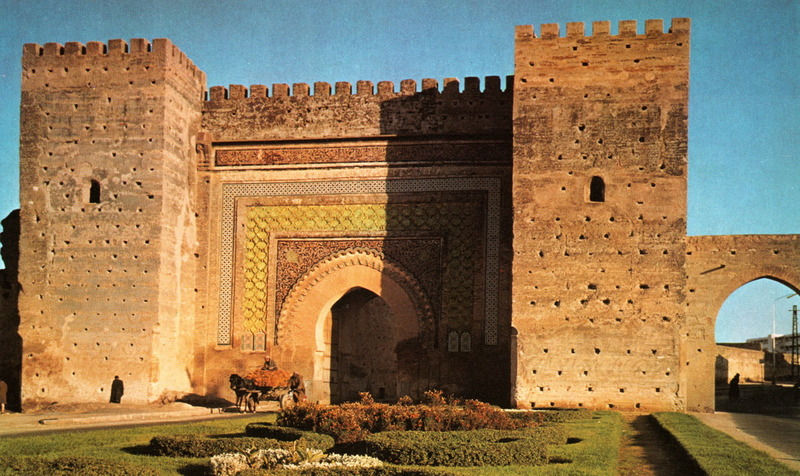 The focus is on the three pavilions built during the reign of Sultan Ahmed Saadi El-Mansour. The first on the left is the prayer hall, which has numerous tombs, mainly from eighteenth century Alawite rulers. Next to it there are three tombs surrounded by a dozen of marble columns, known as the Hall of the twelve columns . The central tomb is Ahmed El-Mansour´s, flanked by his son and grandson. The third pavilion has Andalusian style entrance doors . Outside the building there is a garden with the graves of soldiers and servants. Rue de la Kasbah, Bab Agnaou (no phone). Opening 8.30-11.45, 2.30-17: 45 daily. Admission is only 10 dirham. One of the curiosities of Marrakesh is the Museum of Photography which is located inside a Riad located in the rear of the Museum of Marrakesh . In addition, the exhibition features one hundred original photographs of the first photographers installed in Morocco. Every Friday afternoon, from 19:30 to 21:00 there is a projection of a period film. 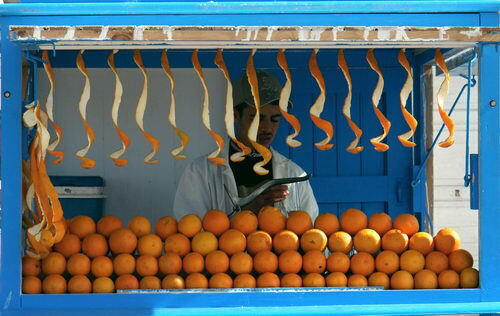 This is an amazing place for lovers of Morocco, Marrakesh and photography ... HIGHLY RECOMMENDED place. Visit it and you will get inspired to portray the daily life of this photogenic city. If we want to get into the medieval Marrakesh, it is a must to visit the tannery quarter who have been doing their job in this place since the founding of the city. With hundreds of tanks filled with wasted liquids to cure animal skins, the stench can be overwhelming, so it is advisable to get in the nose a few mint leaves that can be arranged at the entrance. The process for treating skin has remained the same for centuries. First, the skin is placed in a pool with lime with to remove the animal's hair. Then it is introduced into another tank full of pigeon droppings, which acts as a natural ammonia while young men jump and hit the skin. Finally it is immersed in water with flour to give texture to the skin. When the desired texture is achieved, washing and tanning is made by hand. It's not easy to find the place as it is located a few hundred meters from the souks, so we recommend hiring a guide to explain to us the handmade process and what we're seeing. Besides being one of the most representative postcards Marrakesh, the focus is on living the show organized by the tanners while performing this hard work. Perhaps seeing their work will help us to better consider the work it takes to make a simple slippers. The Badi Palace in Marrakesh, known in his time as "The Incomparable", was built in the late sixteenth century by Sultan Saadi Ahmed al-Mansur to celebrate his victory over the Portuguese army in 1578 in the battle known as the Battle of the Three Kings. According to the chroniclers of the time, it was the wonder of the Muslim world. It was built from 1578 to 1603 with the richest materials to decorate its 300 rooms. Today only a vast esplanade remains, planted with orange trees and surrounded by high walls, as in 1696, the Sultan Moulay Ismail Alawi demolished in its pursuit of materials with which was raised the new capital in Meknes. The plans of this jewel of Islamic art were influenced by the Alhambra in Granada. Inside the Palace, the minbar (pulpit) of Koutoubia, carved during the twelfth century by craftsmen from Córdoba in cedar wood and inlaid with marquetry and small deeds done in gold and silver is on display. Do not forget to climb the walls to enjoy spectacular views of Marrakesh..
Come on, you must visit this museum where you will find some curiosities about Marrakesh. The Museum of Marrakesh, next to the Ben Youssef Madrasa, is housed in a magnificent palace of the late nineteenth century, typical representation of the Moorish art and has been transformed into a private museum where you will find all kinds of cultural activities. 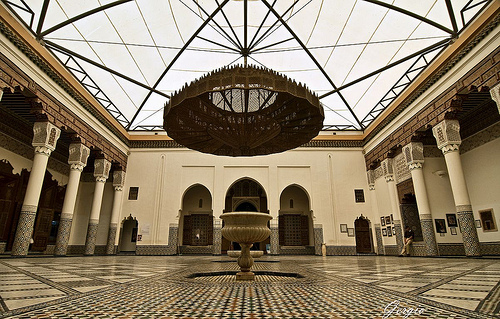 This museum has organized since 1995 only non-permanent exhibitions of contemporary Moroccan art or cultural heritage. Downstairs hammered copper objects, arms and Berber jewelry and clothing are displayed.. The first floor lounge has a Spanish-Moorish decor and cedar furniture. The museum also organizes and hosts various events such as concerts, theater and dance performances, film screenings, seminars, study days and workshops. Open daily from 9:00 to 18: 30, entry costs 30 dirham. Remember the ticket also serves to visit the Ben Youssef Madrasa. 10. TASTE THE BEST TEA OF THE WORLD. Morocco is known for being a major consumer of tea. The tea arrived quite recently to this land and spread rapidly becoming its national drink. On your journey around Morocco, you will drink many Moroccan mint teas and of course if you come to Marrakesh and stay with us, probably, the first will be in the Riad La Belle Epoque. Although alcohol is not very popular in Muslim culture and it is not easy to get a license for sale, do not forget that Marrakesh, with its Medina, is one of the main tourist centers in Africa which means a lot of money, so every day new establishments ask for a license to sell alcohol inside and outside the Medina. A few years ago alcohol was consumed inside these establishments with license, but eventually the customs are being relaxed and nowadays you can find many places where you can have a sip on the terrace. Moreover many of them are on top of buildings which makes them perfect viewpoints for watching the sunset or relax with great views. Gueliz area, outside the Medina is the most interesting place to go to bars or terraces. The street atmosphere is excellent, and you can find here a endless variety of bars where you can enjoy a drink. Our favorite is the bar in the Le Marrakech Hotel. If you are looking for a chill out, you should go to Mooi, with live music, happy hour and all you can expect from the most fashionable bar in town. In Mohammed V Avenue and vicinity very recommended terraces can be found, as Le Mirador which is located on the 7th floor of Hotel La Renaissance with breathtaking views. In this area Le Petit Poucet, Café-bar l' Escale or Café Atlas worth a visit. In Casablanca Avenue, Cafe Oued is a small complex of three different ambiances, perfect to enjoy a drink in peace. Inside the Medina. the highlights are Café Arabe with its elegant terrace that invites us to spend cocktail nights while watching the Atlas Mountains and Kosybar, also with a magnificent terrace and live music. The jewel of the crown, Le Bar Churchill is inside La Mamounia hotel. Sumptuousness and James Bond style dress code, this is one of the most iconic and unique city bars. This is your place if you like jazz, exclusive ambiance and you have enough money in your wallet. Of course, within the Medina you have many terraces with great views, but most of them do not serve alcohol. Our favorite is the Cafe des Epices in the square with the same name. In Marrakesh, the culinary offer has exploded in recent years. There is something for every taste and every budget and Moroccan cuisine has variety and nice taste. We have published a post where you can have a look to the best restaurants in town. If you are traveling with low budget or you simply prefer cheaper options, the go to Jemaa El Fna square. 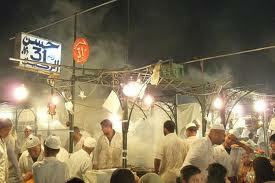 Dozens of stalls are open every night with a wide selection of Moroccan gastronomy. Close to Riad La Belle Epoque there are few good restaurants. Ask us and we will be delighted to help you in your reservation. It is said that the French soldiers of Bonaparte, during the invasion of Egypt, were impressed when they saw the sensual belly dancing performance and at first, they mistook the dancers with prostitutes. Oriental dance has an aphrodisiac and exciting power that leaves no one indifferent. Originally from Lebanon, it has spread throughout the Arab world and we can see this show in many places inside and outside the Medina. It's Saturday night. You just go to the dance floor illuminated by flashes of neon. A cosmopolitan crowd dance African rhythms mixed with hits you know. Around you, beautiful people, coming from all corners of the world. Maybe even some famous actor is close to you. The luxury and aesthetics of the place strikes you and you wonder where you are...... You are in Marrakesh ..... is that possible? The night in Marrakesh will surprise you, that's for sure. There is little we can add to the post we published about the night in Marrakesh. We invite you to take a look at our post about it (la marcha en Marrakech) and plan what will be your next party. The options are endless and here we summarize our favorites. Pacha, Teatro .... are names that you will not forget easily after a night in one of these discos. 15. RELAX IN A HAMMAM. You have been all day walking around the city. Your feet are sore, you've felt the heat and you wish being close to your accommodation to freshen up, wash and take some rest and suddenly you come across a hammam. What are you waiting for? Get in there, this experience is something you can not miss during your stay in Marrakesh. There are hundreds of hammans scattered throughout the city for all budgets. We have previously published a post with a series of recommendations and a selection of our favorite hammams that we invite you to read and. Do not hesitate to ask at the reception of Riad La Belle Epoque and we will help you to book any of them. 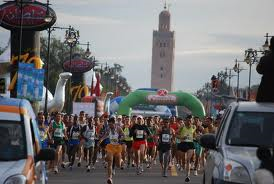 Follow it or participate in this sporting event that runs through the main streets of the city in an environment of 1001 nights .... the public will encourage you so much that maybe you will finish the marathon like on a flying carpet. February: Festival Dakka Marrakchia. Feel the rhythm of the street during the parades and street performances spread throughout the city during the days this ancient traditional music festival is held. July: Festival National des Arts Populaires. 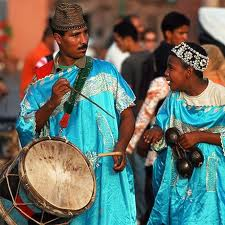 More music, dance and street performances, invade during a few days the streets of Marrakesh in a spectacular showcase of the varied Moroccan folk. November: Festival International du Film de Marrakech: What about attend to a projection of a Bollywood film in a full Djemaa El Fna? We guarantee you a unique and unforgettable experience. During these days Marrakesh is packed of film stars and the ambiance of the city is unmissable. Throughout the year other events occur and we will inform you promptly in this blog or in facebook . 17. 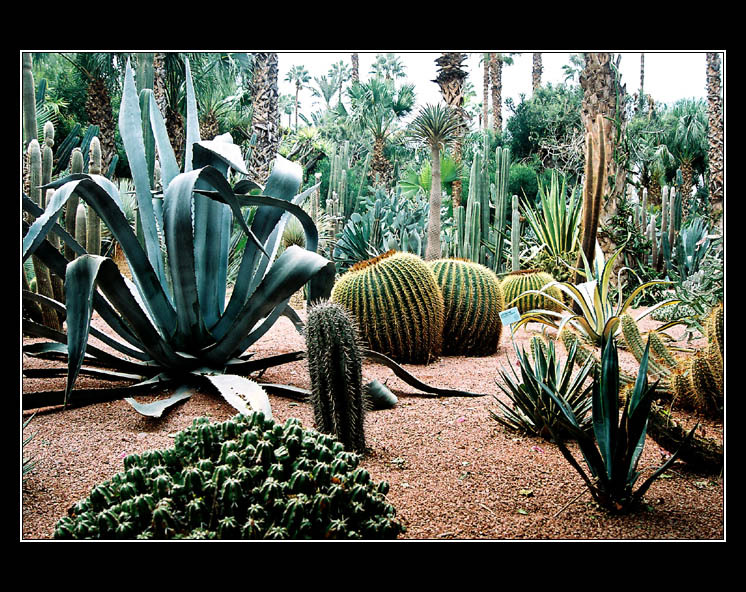 GET INSPIRED WITH THE GREENERY AT THE MAJORELLE GARDEN. 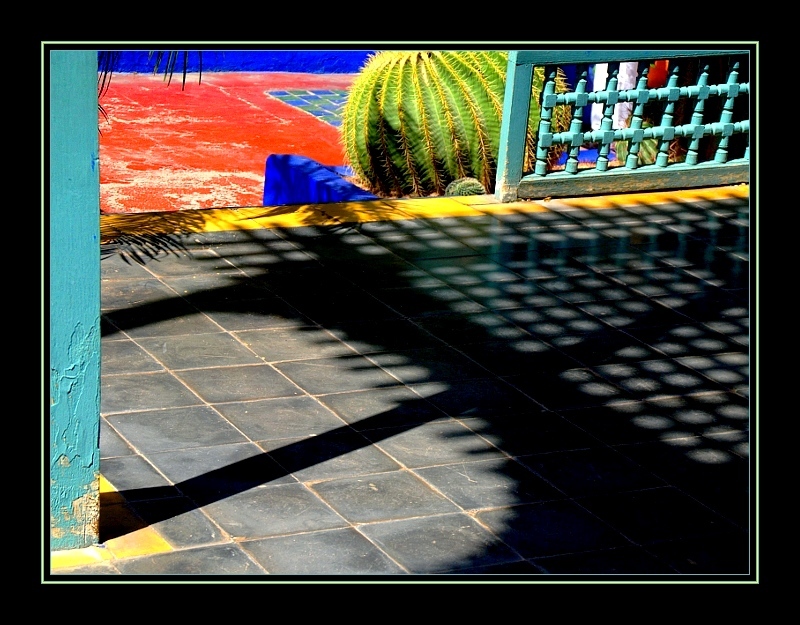 The Majorelle Garden was designed in 1924 by French artist Jacques Majorelle as a place to be inspired. Lover of botany, he created this garden around his house, with several rooms, surrounded by vegetation. In 1937 the artist created a crisp and clear colour, ultramarine blue, and he called it the Majorelle blue, using it to paint the walls of his villa, and later the whole garden, open to the public from 1947 to 1962, when it was closed and finally abandoned.. The couturier Yves Saint-Laurent acquired the garden in 1980 restoring and adding large number of plant species. The entrance is a bit expensive compared to the other attractions of Marrakesh (50 dirhams) but this does not prevent it from being one of the main attractions of Marrakesh. Don´t miss it. 18. FEEL LIKE A MARRAKECHI IN THE MENARA GARDENS. If you want to see how the population of Marrakesh enjoys his spare time, walk around the massive Menara Gardens, located 2 km far from the city. You can get there walking, by taxi or in a calash ride. Get out the Medina crossing the Bab Jadid door and taking the Avenue de la Menara, in less than an hour you will be at the park. The large pond populated with carps, was created in the twelfth century. It was designed with a system of underground pipes that brings the water from the nearby Atlas permitting to irrigate the surrounding olive groves and orchards. The system is still used today. The best time to visit these gardens is at dusk and its main point is located in the central area, where the Menara Pavilion can be seen and next to it the huge artificial pond. 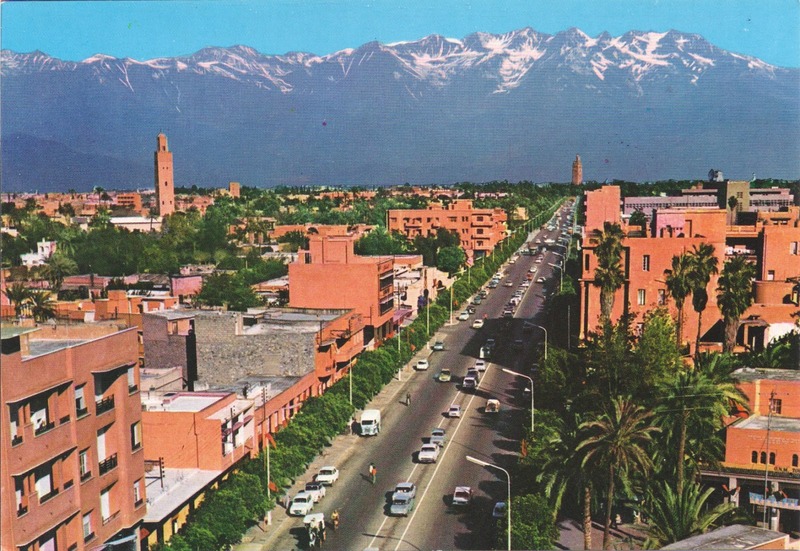 Perhaps this is one of the most representative photos of Marrakesh and the Atlas view is stunning. The charm of the the Menara Gardens changes seasonally and in winter and spring, the snow-capped Atlas seems to be closer. In summer, the gardens offers a cool and quiet space to relax or enjoy a picnic along with marrakechíes escaping from the city heat. From November to January you'll witness the olive harvest around the pond. Opening hours: Open daily from 8.30 am to 18 pm. Free admission. Built during the time of the French protectorate, "the Nouvelle Ville" or new town, offers a contrast to the Medina. The new part is west of the Medina, with its large avenues like Mohamed Mohamed V and VI, packed with shops and international boutiques, fast food restaurants, cafes and terraces for the upper and middle class and where you we will feel very happy if you want to return to the West for a few moments. In fact, Gueliz has always been chosen by most foreign to reside in Marrakesh area. 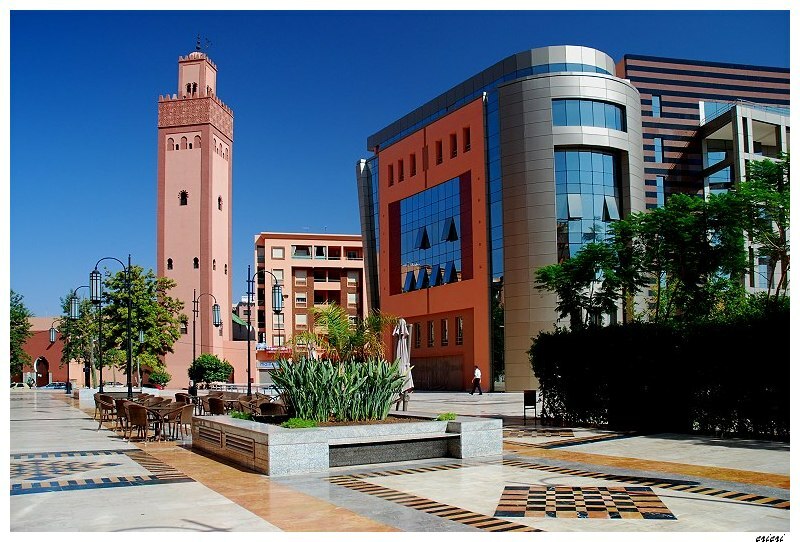 There are also large hotels and luxury boutiques in Hivernage area, south of Gueliz, newer construction in response to the growing touristic demand of Marrakesh. Besides the striking avenues and luxurious residences that can be seen in this area, other attractions can be visited nearby the Gueliz like the Royal Theater, or the great palace of congresses which has an imposing facade. As we mentioned before, in this part of town are located most of nightclubs, bars and restaurants where you can drink alcohol. The Walls of Marrakesh, around the Medina, were built in the early twelfth century by Yusef Ben Ali, son of the founder of Marrakesh. Its striking red color changes according to the sunlight. They extend along nineteen kilometers and served to defend the city. Its high walls, up to eight metres, surround the Medina or old city, which is accessed through several gates of singular beauty. There is a signposted route along the entire wall, allowing to appreciate the details of the doors, also known as Bab. Don´t miss Bab el Jadid, Bab Doukkala or Bab el Khemi. It is a long walk but it can be done in two days and gives us an idea of life in this city. You will find markets around the doors. With over 100,000 palm trees planted in an area of ​​13,000 hectares, the palm grove of Marrakesh is now the center of a large urban plan that includes residences, luxury hotels and golf courses, but it still remains a mystical place and source of wealth for the city as it wood and dates are obtained here,being in itself an ecosystem that coexists with various orchards. It can be visited by taxi or carriage from the square, a pleasant walk of about 2 hours and 200-250 dirhams (20-25 €) but the activity that attracts more tourists, is the camel ride. They are scattered throughout the palm grove and it is a funny experience. Price is negotiable but for about 100 dirham, about 10 €, you can take a walk of reasonable length. If you go by carriage, your driver will be happy to wait in exchange for a tip. Marrakesh has a privileged location, situated on the edge of the desert and at the base of the majestic Atlas Mountains. Perhaps this is the reason why several companies have emerged in recent times offering balloon trips over the city and its surroundings. From 1,990 dirham (about 180 €) per person you can enjoy this wonderful experience for one hour and dazzle you with views of Marrakesh and the Atlas. Fantasy or Powder party is a very interesting show and one of the non-religious manifestations of Moroccan popular tradition that occasionally can be seen for free along the wall on the road to the airport or nearby the palm grove or if you don´t have this chance, you can attend to a dinner show every night at Chez Ali. From € 42 per person including dinner, show and transportation. Obviously the second option lacks the authenticity that would be desirable but if you haven´t seen any Fantasy show on your tour of Morocco, this is your chance. It is very touristic, yes, but worth it. The Riders are grouped by towns or neighborhoods wearing their best clothes, usually light colored, simple and elegant, topped by a turban and cloak. They ride spectacular Arab horses, superbly decked with trappings of gold or silver and the famous beautifully decorated saddles with a particular form that require to ride in a forward position, with advanced knee and back heel, thus facilitating balance required for warlike actions. The horsemen start to gallop in a compact group and suddenly they all shoot their carabiners or mukkahlas synchronously in the air while they stop their horses in just one foot of ground in a spectacular braking. If the shots sound like if it had been only one, the crowd goes wild and applauds wildly. 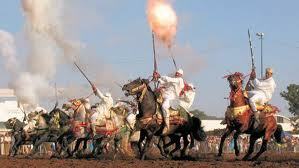 The smell of gunpowder and horse, with thunderous shots and neighing, create a mixture that will make us vibrate. You have got to admit that Moroccan food has captured your attention and you would love to delight your friends back home making a couscous or a lamb tajine. 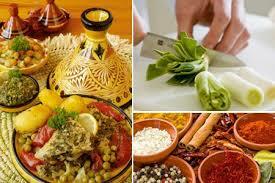 Well it's easier than you think because during your stay in Marrakesh you can do a cooking course. If you want something more professional there are several cooking schools that offer courses of different duration and price. Ask us and we will gladly help you. We are fortunate to have a Riad in the Medina of Marrakesh. Something that took us a lot of effort, sweat and tears and maybe one day we will tell you the story of this space, but what we can say is that after crossing the threshold of Riad La Belle Epoque you will not feel indifferent. This is corroborated by the vast majority of our visitors as can be seen on TripAdvisor. If you stay at a Riad, you will enjoy Moroccan hospitality, feel like a Maharaja for a day, as in a 1001 nights story and somehow go back in time. 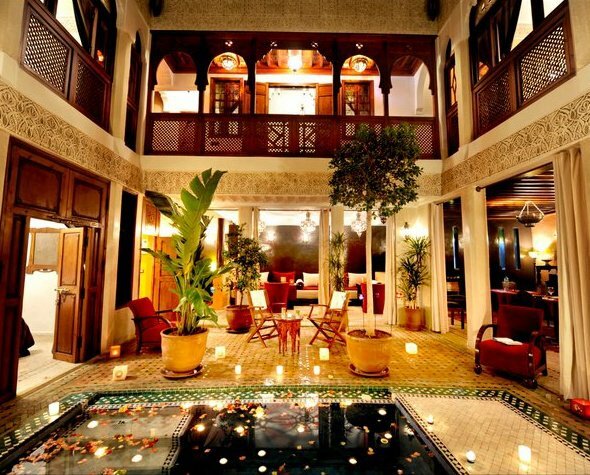 Staying in a Riad is being away from the noise, the dust, the bustle of the street and to refuge in an oasis of peace. A treat for your senses where relaxation is assured. The easiest way to explore the Moroccan daily life without sacrificing comfort and also a great way to interact with local people as at these small establishments the attention can be much more personal and closer than at a normal hotel. ENJOY YOUR VISIT TO MARRAKESH!!!!! !